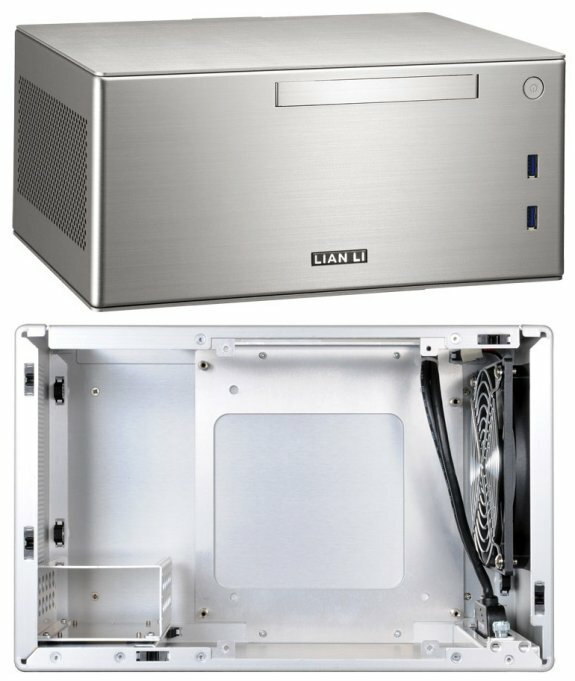 Lian Li delivers the PC-Q9FN, a new HTPC case designed for Mini-ITX motherboards. Available in black and silver, this aluminium case measures 296mm x 140mm x 190mm (W x H x D) and weighs just 2.44kg. It has one external 5.25" drive bay, support for one 3.5" HDD and three 2.5" storage devices. There's one included 120mm fan in the rear, USB 3.0 support is included and the case ships with a 300W SFX PSU with a 80Plus efficiency rating. With the upgraded dimensions of 11.65” x 5.51” x 7.48” WxHxD (296mm x 140mm x 190mm), the PC-Q09FN gives DIY computers builders the space to install the essential hardware for home theater applications. Lian Li's PC-Q09FN supports a slim optical disk drive and a 3.5” HDD that can easily be taken in and out using the included thumb screws with rubber suspensions to reduce vibrations. A removable 2.5” hard drive cage allows up to three SSDs to be installed in this mini-ITX HTPC. Lian Li's PC-Q09FN comes with a 300W micro-ATX power supply with 80-Plus efficiency included, and will be available in black and silver in selected countries and various vendors for the suggested retail price of $149.99 (VAT not included).